BEVERLY HILLS, Calif. — The Golden Globes have long had a reputation for being Hollywood’s most rollicking awards show, but Jan. 6’s proceedings began with a tender moment of reflection amid the romp and the revelry. 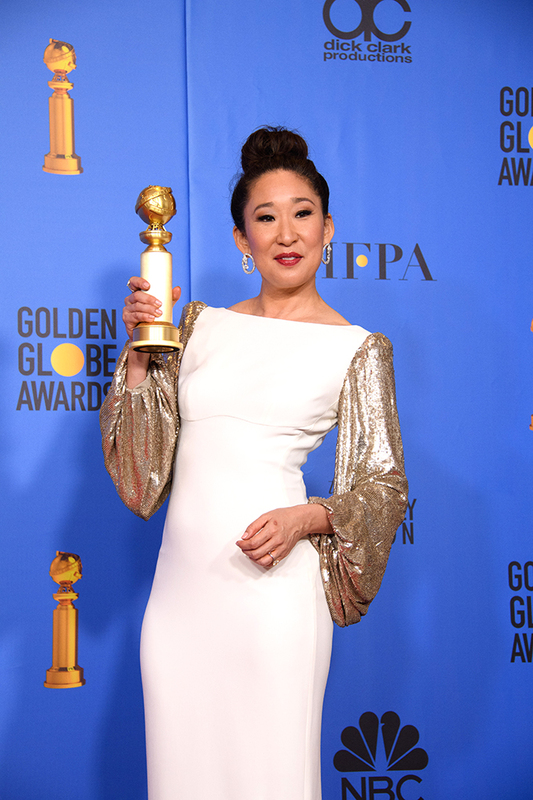 “I said yes to the fear of being on this stage tonight because I wanted to be here, to look out onto this audience and witness this moment of change,” the Killing Eve star Sandra Oh said as she closed out the opening monologue alongside her co-host, the comedian Andy Samberg. The first person of Asian descent ever to host the Globes, Oh also shouted out the earning power of Crazy Rich Asians, joked about Asian moms being difficult to impress, and directed the cameras to focus on her own (beaming) mother in the audience. Emma Stone, who drew ire for playing a character of Chinese descent in the latter film, shouted “I’m sorry!” from the audience. Later in the ceremony, after winning her own Golden Globe for Best Actress in a TV Drama Series, Oh again embraced sincerity, nodding to her parents. “There are two people here tonight that I’m so grateful that they’re here with me. I’d like to thank my mother and my father,” she said tearily before addressing them in Korean: “Mom, Dad, I love you.” The Golden Globe was Oh’s first (and only the second win for any Asian performer) in that category. Oh, Constance Wu, and Darren Criss, who is half-Filipino, were the Asian acting nominees this year. The last time the Globes honored an all-Asian film at that level was the 1961 musical “Flower Drum Song,’’ which was nominated in the same categories as “Crazy Rich Asians’’: best comedy or musical and best performance by an actress in a musical or comedy. The Globes has doled out nearly 1,000 film and TV acting trophies in its 76-year history, including for now defunct categories like best juvenile performance and “new star of the year.’’ Of all those wins, 10 have gone to performers of Asian descent, including Oh. Chris Tashima, a member of the Academy Asians Action Committee, an informal group of Asian and Pacific Islander members of the Academy of Motion Picture Arts and Sciences, believes the recognition has made more people aware that the success of “Crazy Rich Asians’’ wasn’t a fluke. Ellen Huang, senior director of diversity for the SAG-AFTRA, said it’s clear that there’s a market value for making movies and shows that are diverse and well-crafted. “While the industry is moving in the right direction, there is room for improvement — particularly in the casting of leading roles,’’ Huang said in a statement. Oh’s hosting gig for the Globes seems almost karmic. She, Tashima, and other Asian Academy members met with the Academy about jokes host Chris Rock told at the 2016 Oscars at the expense of Asians. For one bit, he paraded three Asian children as the accountants who tally the ballots, relying on the stereotype that Asians are good at math. Tashima remembers how Oh spoke passionately about it. “She just wanted to hit home that the response to it was completely emotional, how it hit her personally,’’ he said. The 58-year-old actor and director, who won an Oscar in 1998 for best live action short, said another sign of a page turning is what he’s hearing from fellow actors and writers. “Everyone now is like ‘Oh, where’s that Asian project you had that we rejected? Let’s read that script,’’’ Tashima said. Actor Derek Mio, who recently snagged the lead in the second season of the AMC series “The Terror,’’ believes more Asian-centric projects are getting greenlit. He credits more showrunners and people behind the camera for putting “old ways of thinking’’ into check. “It was just only a matter of time where Asians would get their time, like Latinos and African-Americans as well,’’ Mio said. In “The Terror,’’ the Japanese American actor will play a young man looking into a series of bizarre deaths in a Japanese American community during World War II. One of the creators and executive producers is Alexander Woo, who is Chinese American, and the cast is primarily Asian, including “Star Trek’’ veteran George Takei who will serve as a consultant. Mio recognizes that older generations didn’t have the same opportunities he does. “They were all kind of chipping away at the machine to kind of make way for the younger generations to kind of break through that,’’ he said.